Tim Watson is a beloved hero and favourite son of the Essendon Football Club. He played 307 games for the Bombers between 1977 and 1994 and was known for his bursting pace and skills by hand and foot. His career was decorated with countless awards and his manner earned him a reputation as a gentleman of the game. Following his retirement from the game, Tim’s communication skills helped him forge a successful media career in television, radio, and as corporate speaker. Tim is an entertaining, articulate, and well-polished master of ceremonies. Tim has been a valued member of Channel Seven’s AFL broadcast, providing interviews and special comments. 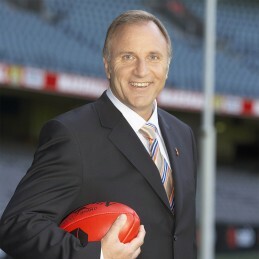 He is Seven’s weekend sports presenter and has co-hosted football programs such as Talking Footy. He also writes a column in The Age each Wednesday. Tim is a polished and highly sought after public speaker who is qualified to speak on a diverse range of topics including leadership, teamwork and managing change.